To start, I create an account in mbed developer website. Then my attention goes to NUCLEO-F401RE page. 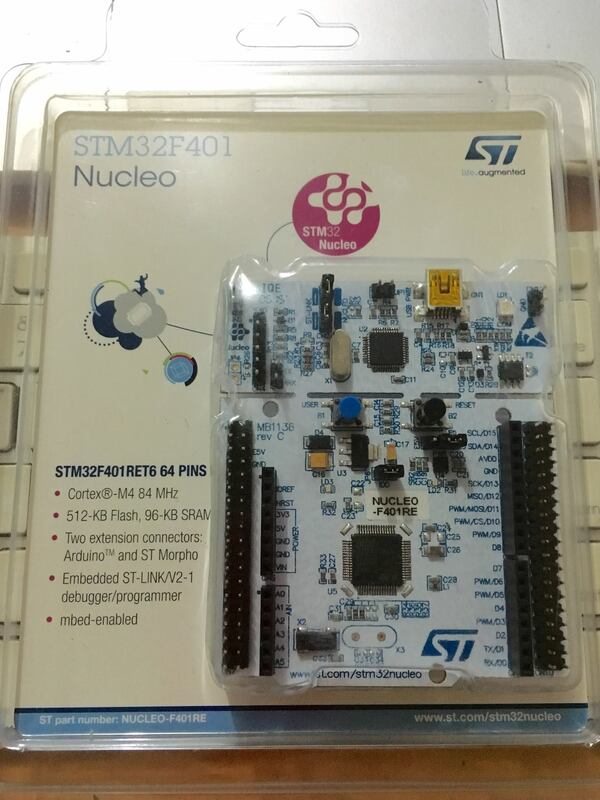 As described in NUCLEO page, I should upgrade the Firmware to the latest version. I follow this link, that eventually requires me to download the latest ST-LINK/V2-1 firmware here. You’ll be presented STSW-LINK007 page, go to the bottom of the page and click Download button. A file named “stsw-link007.zip” will be downloaded. As I’m using OSX, I should open “STLinkUpgrade.jar” file. Make sure you have Java installed on your OSX, as it’s not installed by default. Right click to the file, select “Open”, to make sure it’s opened (in my case, I only allow software from certified developer). Click “Open in update mode”, current firmware version will be displayed. Don’t worry if your Mac warns you that “Disk Not Ejected Properly”, that’s because initially the board is attached as USB mass storage, then it’s unplugged by the software. Finally, “Upgrade” button will be enabled, just click it. If everything goes smooth, few seconds later your Nucle board will have a new firmware. In the getting started page, there’s a requirement to install ST-LINK/V2 driver. It directs me to this link, and I can’t find any driver installers for OSX. Looking around on the forum, I found this discussion, and turned out for OSX (and Linux? ), I don’t need to install anything for Nucleo board to be recognized by OSX. Hurray!